Olive oil Soap with Red Wine and finely granulated cork for antioxidant and gentle exfoliating effects. Bitter orange essential oil. 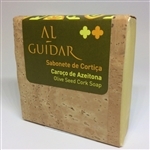 Contains Beeswax Olive oil Soap with Olive Seed and finely granulated cork for gentle exfoliating effects. Rosemary and Cypress pure essential oils. Contains Beeswax Olive oil Soap with Oats for soothing the skin and finely granulated cork for gentle exfoliating effects. Rosemary pure essential oil and honey. Olive oil Soap with Cacao and Carob. Rich and nutritious with finely granulated cork for gentle exfoliating effects. Contains Beeswax Soap Dish - Natural Cork carved from one piece of cork. Cork is anti-fungal, antibacterial and waterproof naturally.